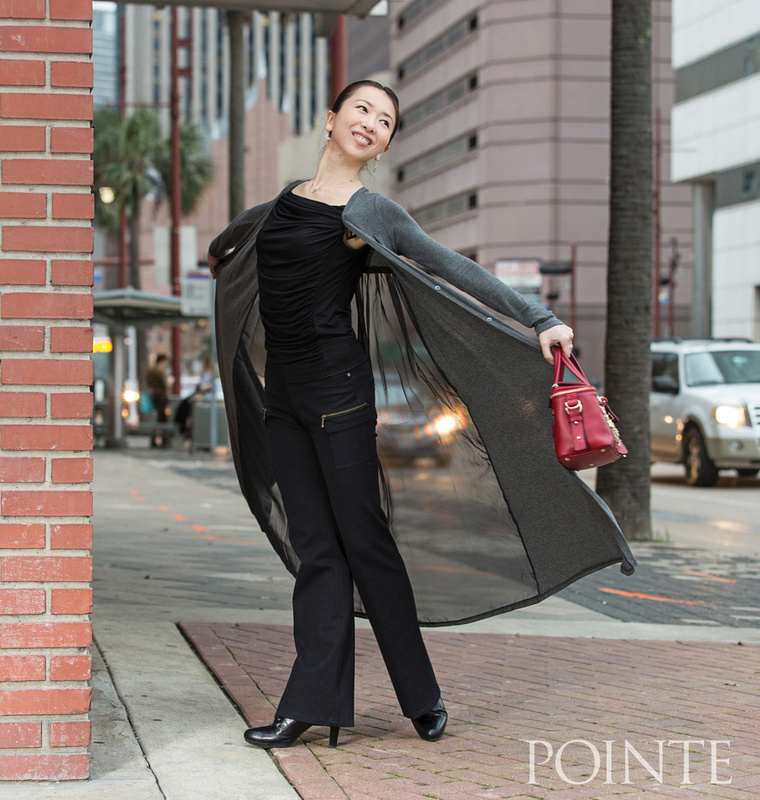 Though she's lived in the U.S. for 14 years, Houston Ballet's Yuriko Kajiya still does most of her shopping at home in Japan. “It's always fun to go shopping with my mom," she says. “We're like girlfriends." When her busy rehearsal schedule prevents her from making a trip in person, she asks her mother to send clothes in the mail. Kajiya likes simple, sophisticated pieces that add height and length. “As a ballerina you're always trying to make your lines look longer," she says. “I think that translates to street fashion for me." In her rehearsal wear, she keeps her partners in mind. “I definitely think about what I have to rehearse that day and try to be considerate," she says. That means choosing leotards with cotton in them (they slip less), and functional styles. “Leotards with really low backs are very pretty, but I only wear them in class," she says—it's harder for a partner to have a firm hold on bare skin. Above all, she tries to keep her look original. “I want to be a little bit different," she says. “I think that's another reason I like to shop in Japan." Sweater from Japan: “My mom sent this to me. I love the flowiness. It reminds me of something I would wear onstage for sure." Heels: “I rarely wear flat shoes. I think with my hyperextension, it's easier to have a little bit of a heel." Morpho bag: “When I was younger, I loved the concept of wearing black because it looks more adult, but now I enjoy playing with color. I use a bright red bag to have a little pop." Chacott leotard: “Chacotts are from Japan, and they're beautifully made. They're very delicate and soft on your skin." Tutu: “When I left American Ballet Theatre, the dancers chose this for me as a gift. It makes me feel good because of all the memories." Kajiya removes her warm-ups for rehearsal so her lines are more visible. Capezio pointe shoes: “Your feet change as you get stronger and older, so my special order is slightly different every year."